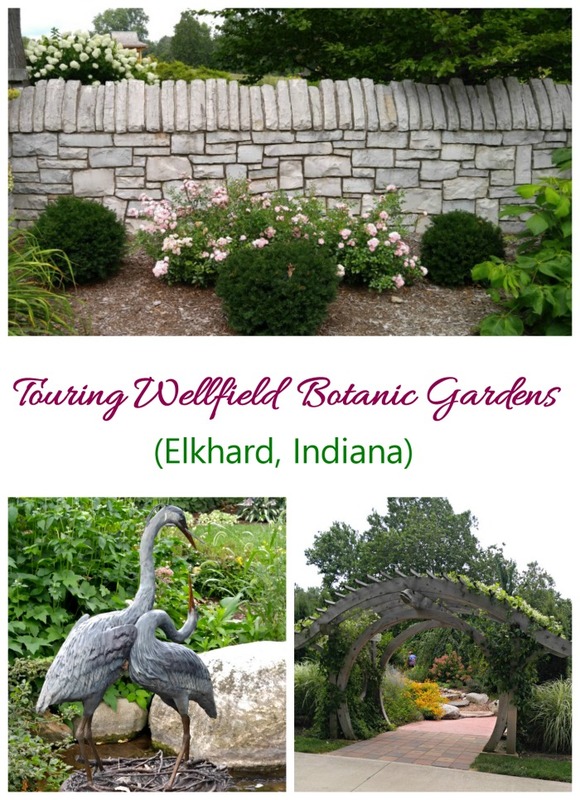 The Wellfield Botanic Gardens in Elkhart, Indiana are like a living museum with art, nature, and structure all coordinating beautifully. 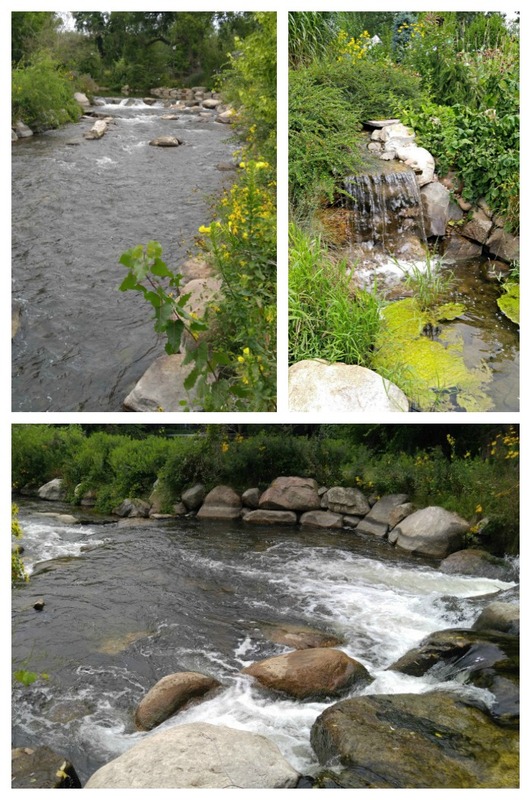 The waters of Christiana Creek stream through the gardens, which are a combination of nature, art and hardscaping that is sure to delight. The Botanic Gardens feature 36 acres of lush gardens against a backdrop of native woodlands. No matter the type of gardening that you enjoy, there is something here to interest you. 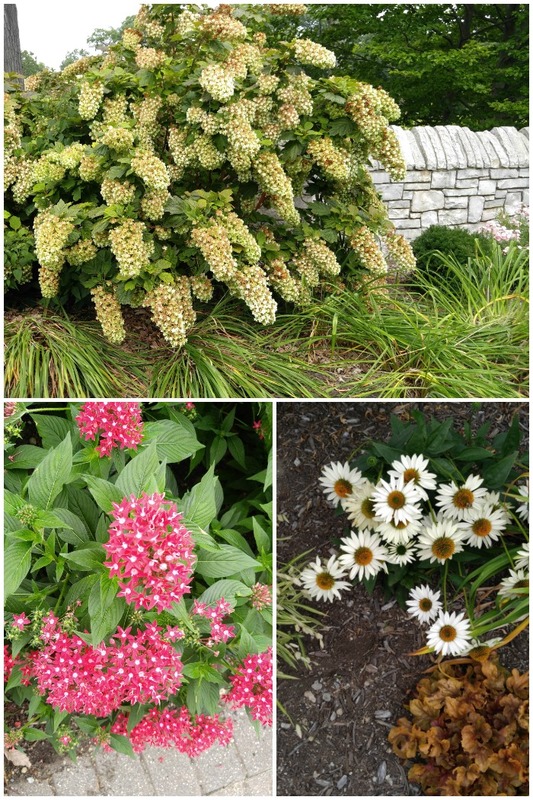 Annuals, perennials and bulbs abound and are extremely well cared for. 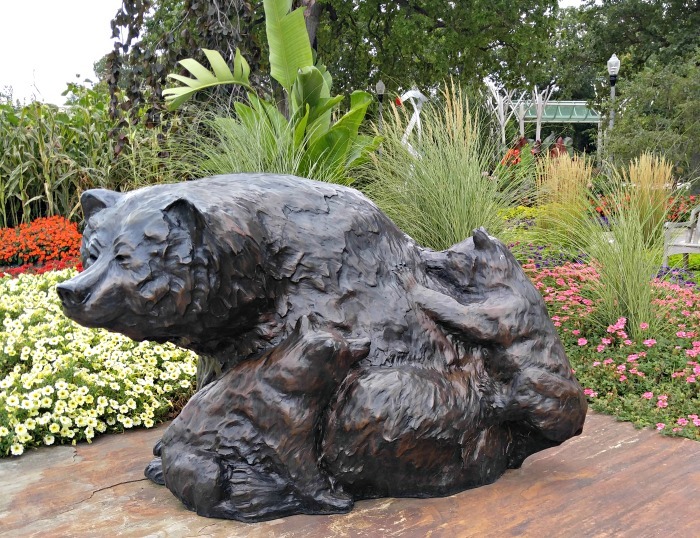 These beautiful Botanic gardens celebrate the combination of nature and art and have many themed gardens, which are both inspiring and educational.The gardens are host to many landscaped beds with water features, lots of walkways and a host of garden sculptures that are sure to delight. 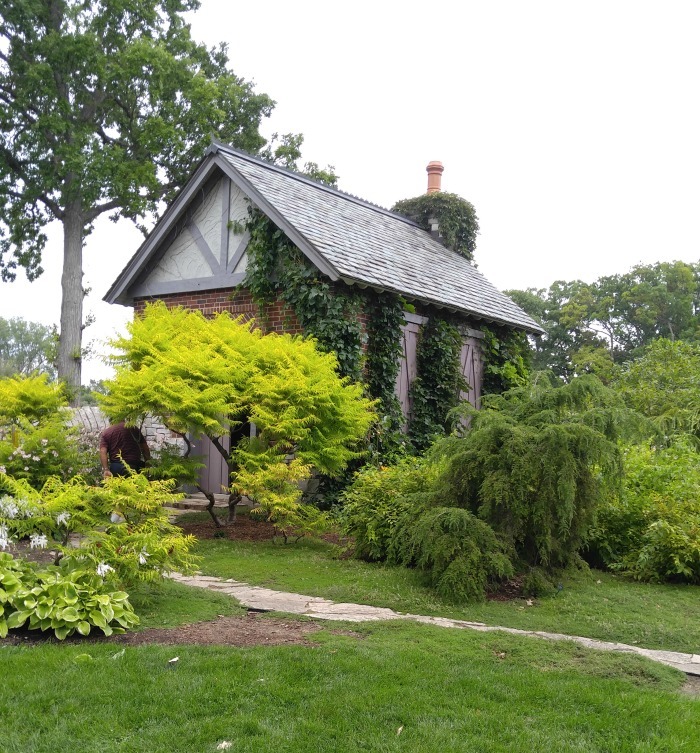 My husband and I spent several weeks last summer touring Botanical gardens along the Eastern coast and as far north as Michigan. The day we spent at Wellfield Gardens was one of our most cherished days. 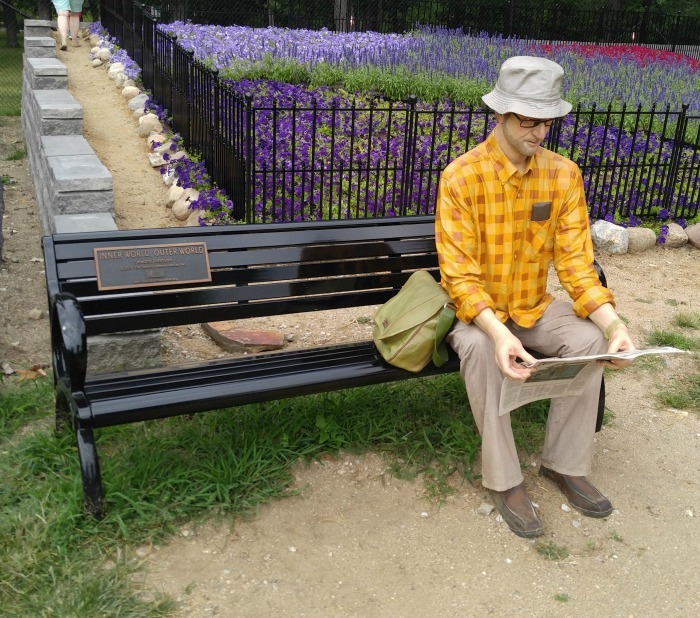 At first glance, I thought this statue was a visitor to the gardens enjoying a moment with a newspaper. Closer inspection showed that it was just one of many statues that the garden has on display. Mr Newspaper Man was seated near the Quilt Garden on the Heritage Trail. This mammoth sized landscaped garden bed, planted with lots petunias and other annuals to mimic the look of a grandmother’s quilt. is just one of 19 eye-popping quilt patterned garden beds and art murals along this trail. 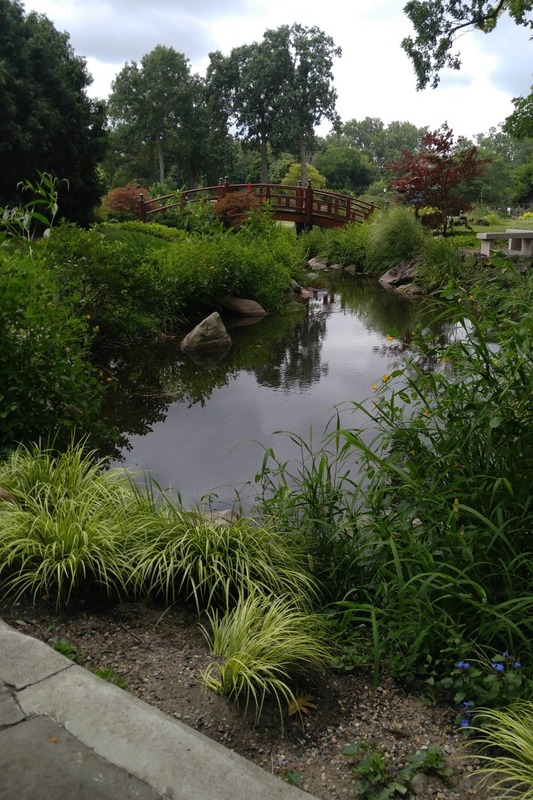 Wellfield Botanic Gardens celebrates nature and water and it’s easy to see why. Christiana Creek is a 10 mile long creek that starts in Michigan and runs south into the Gardens before emptying into the St. Joseph River, just south of Elkhart. The Garden trails loop around this part of the creek and are very relaxing and beautiful. Every part of the Gardens has a view of this lovely creek. There must be something in the water. 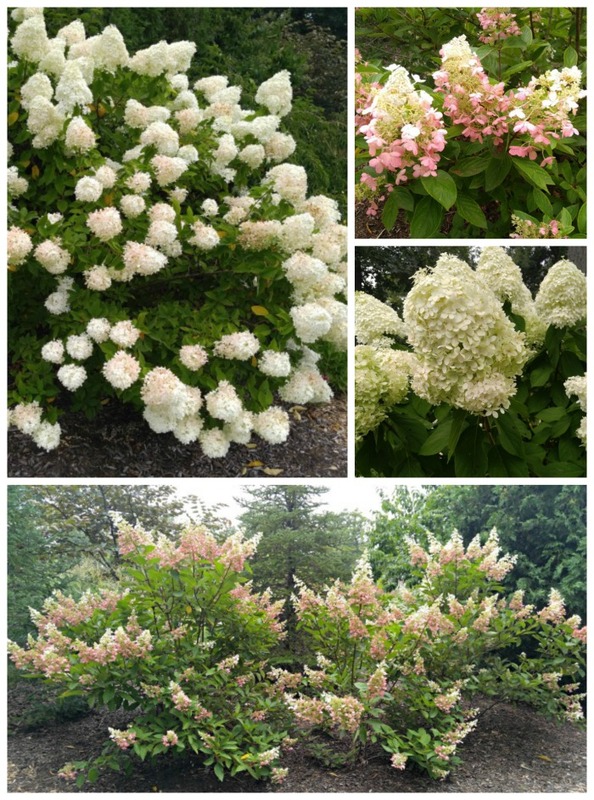 Look at the size of the blooms on these hydrangeas and other perennials! They were mammoth and in such good condition. All along the pathways, no matter where we looked there were statues and artwork. 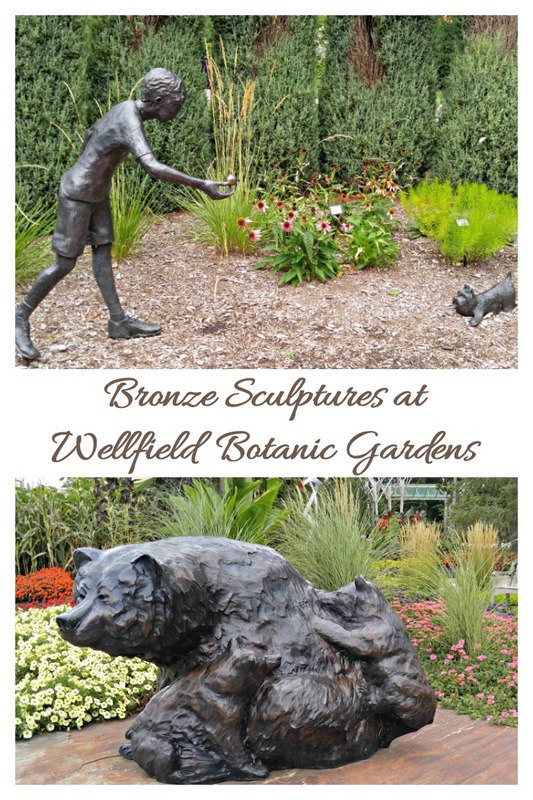 Wellfield Botanic Gardens is known for their displays from talented, local artists. The Island Garden was under construction when we visited but we were able to get a glimpse of what it will be like when it is done. This garden will be a 3/4-acre Japanese-style garden. Boulders (weighing up to 12,000 pounds!) were in the process of being added. All the entries to the Island Garden used the water as focal points. This gazebo was so relaxing looking. 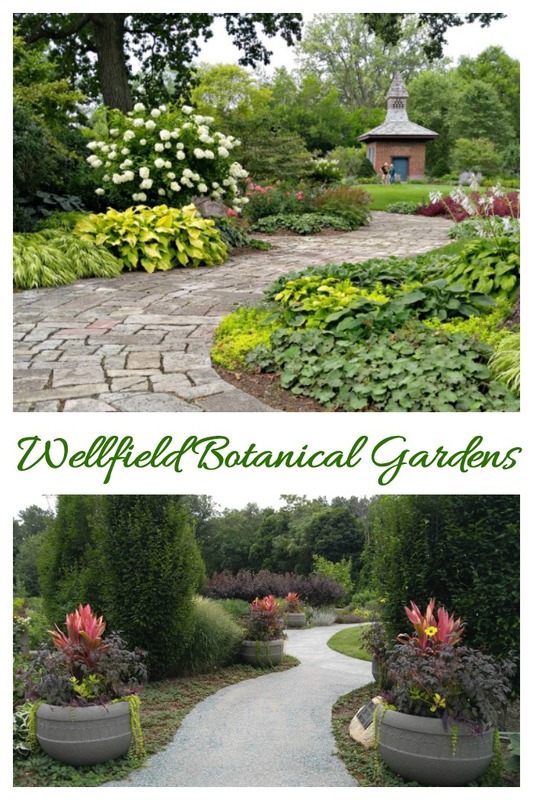 The hardscaping at Wellfield Botanic Gardens was magnificent. There were rustic trails with paving stones that were uneven to walk on but lovely to look at. Then one would turn a corner and come upon magnificently paved walks with formal planters. Everything moved from one area to another in a seamless way that was so pleasant. We walked for a long time and never got tired of seeing what would come next. 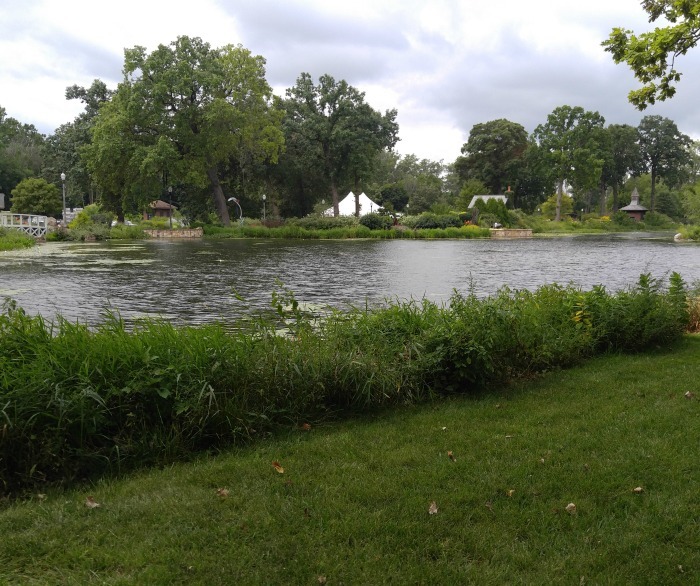 Since the gardens border on the Christiana Creek, it stands to reason that water would be a big focus of the Botanic Gardens. Waterfalls, running water, and ponds with water lilies were just a few of the attractions. My favorite area had running streams all along one side and lovely seating areas were we could sit and admire the mood of the place. And then we would walk a bit further and come along an area with landscaped gardens around water with Japanese style bridges. It was just amazing! Arbors and arches defined the entry to many of the different themed garden areas. There were so many types and each one a beauty in its own right. The English Garden was a favorite of mine. It is a favored place for weddings and even has a dove cote on top of a charming building. 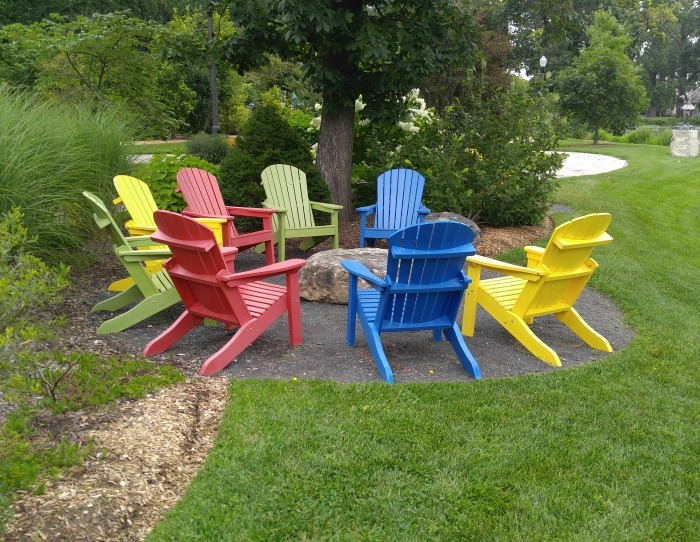 Pick your color and sit a while! This is just one of many seating areas along the Creek where you can relax and enjoy the surroundings. 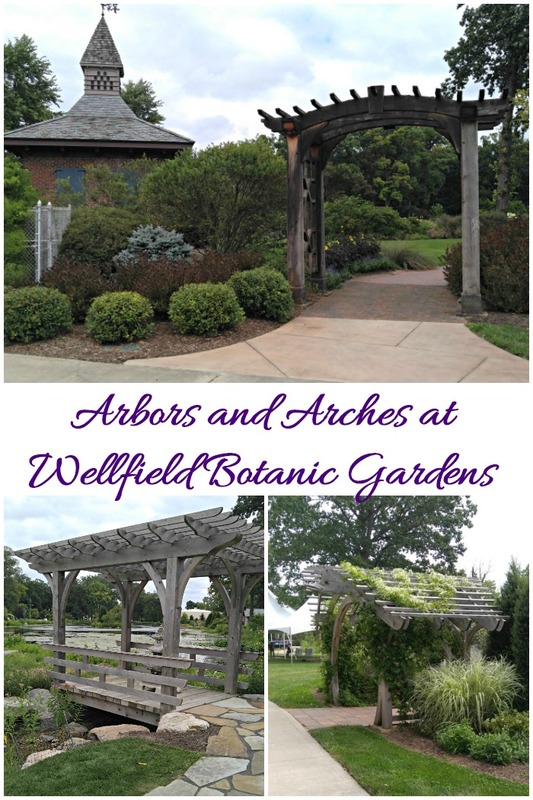 Wellfield Botanic Gardens has a full event calendar. When we visited the botanical gardens in August, they were holding their Taste of the Gardens event. 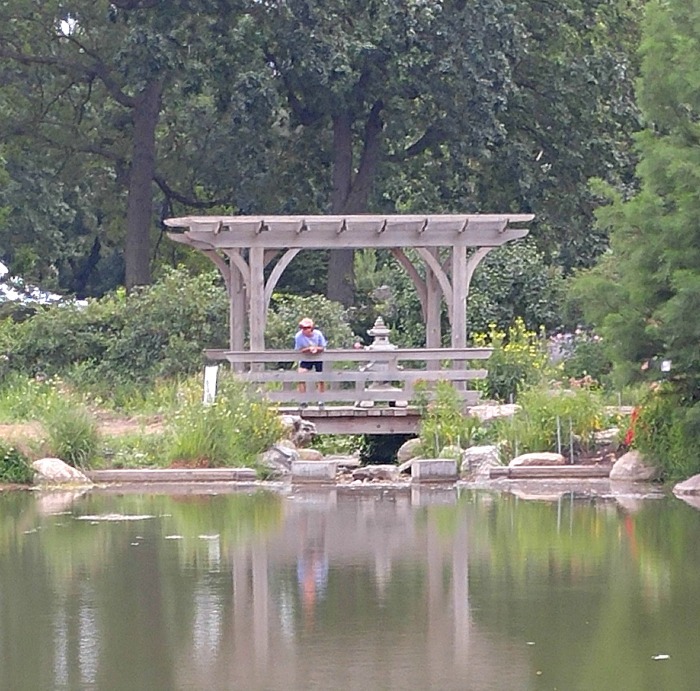 The gardens were established in 2005 by the Elkhart Rotary Club. The original plan was for 25 themed garden and event spaces, a visitors center and guest amenities. 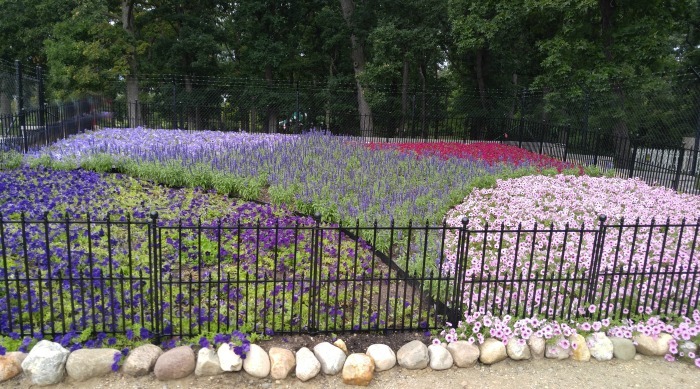 Inside the garden’s 36 acres is a historical piece of property known as the “North Main Street Well Field.” This has been a source of hydraulic energy and drinking water for the City of Elkhart since the mid-1800s. 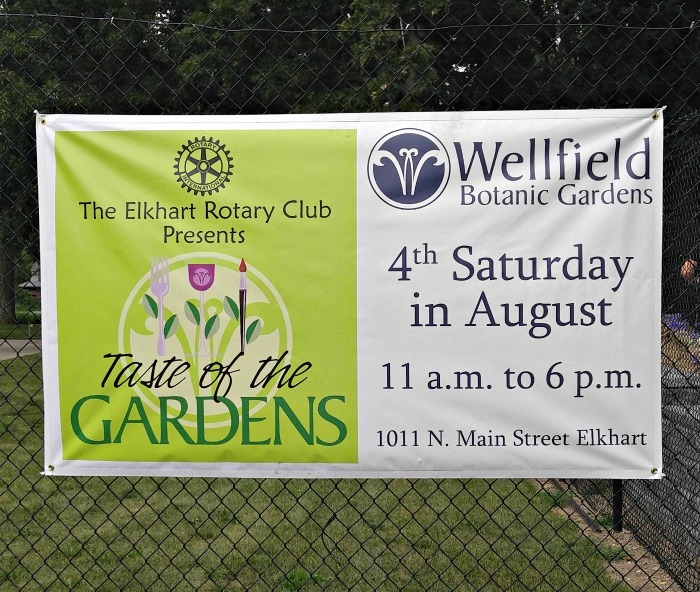 Wellfield Gardens are located at 1011 N. Main Street in Elkhart, Indiana. They are open for seasonal hours Spring, Summer and Fall 7 days a week – Mon-Sat from 9 am to 7 pm and Sunday 11 am to 5 pm. If you are in the area this year, be sure to drop in for a visit. It is a fun filled day well spent. They have more limited hours in the winter with many seasonal themed activities such as a Where’s Santa hunt and Holiday Lights. Find out more about the seasons of Wellfield here. If you would like to bookmark this page to remind yourself of the post later, why not pin this image to one of your Gardening Boards? Which Botanical Gardens have been your favorites? I’d love to hear about them in the comments below.